View cart “Fill in blanks” has been added to your cart. 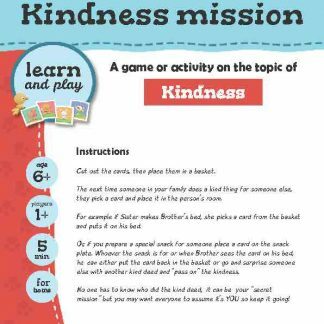 This game gives little reminders of what it means to show kindness. Cut out the cards and divide up the bigger sentence cards evenly to each player. Place the smaller word cards in the middle of the table face down. The first player takes a turn to pick a word from the center and see if it matches one of the blanks on his sentence cards. If so, he places it on top. If not, he turns it over again and leaves it in the center. The next player then has a turn doing likewise. The player that has finished all his cards first is the winner.